I know my birthday was a month ago, but I never posted about my present from Dave! I had wanted this gift pretty much since my last birthday. What is it, you might ask? It’s a new… BIKE!!! (I felt like the announcer guy from the Price is Right when he would announce what the would win!!!) 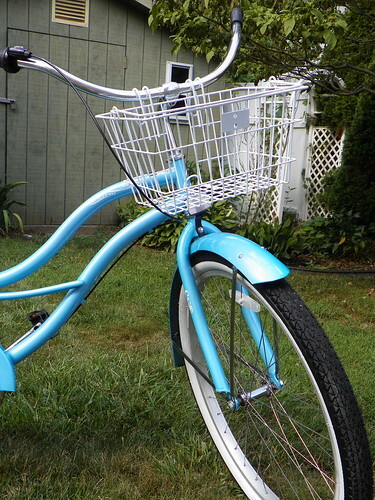 And not just any bike, but a new BEACH CRUISER!!!!!! Isn’t she (yes, she) a beaut? After some research and in-store testing, we ordered the bike online from a reputable store. You’d be surprised at how few stores other than Target carry beach cruisers around here. Or maybe not, since its the Bronx… whatever. At first I was all for a super girly, feminine, pink ride. But then, I’m not really a super girly, feminine kind of girl, so I opted for sweet baby blue instead. And of course the bike needed a name, so after much deliberation and back and forth (mainly on my own part… Dave just looked at me like I was crazy) the bike was christened – Betty. Yes, after Betty Draper. The stylish, classy bike needed a namesake to match… so there you go. (I love Joan, but it doesn’t quite have the same ring to it.) I’ve had a lot of fun riding Betty so far (HAHAHA TWSS!). It’s seriously fun to take around the neighborhood, and the comfort makes riding around with Dave a lot more enjoyable. Plus, not having to drag the bike up a flight of stairs definitely helps with the biking motivation! P.S. like the sneak peeks of our new backyard and apartment? Do you have a bike? Cruiser, mountain… tricycle? BEAUTIFUL!!! Joe got me a peach Schwinn cruiser for my birthday last year. We special ordered her from the Schwinn dealer in town. I just affixed a bell to her that’s in the shape of a coffee cup. Her name is Lady Jane and she has a basket, too!! Betty and Lady Jane would probably be the best of friends. If I could bring Betty to Chicago so they could meet, I would. Wow, our comments are always nerdy Hahaha. If I were to ever buy a bike, it would be that one. That exact one. Give it to me. Awesome!! That basket is fabulous! Love the color, love it all! I love Betty!!!! I have a fun green bike… it’s a lightish green color so it’s pretty and feminine without being pink like everyone expects out of me. HA! I haven’t read too much this summer bc it’s been so hot here, but last year I rode allll the time. I love it! That’s so sad!! 🙁 Yeah we have a lock for our bikes, just in case. oh it’s so cute and i LOVE that color, so beachy and fun. yay for birthdays and new bikes, hurrah! She looks like a Betty. Good name choice. She’s beautiful! SHE IS GORGEOUS! I welcome her to your family. And I love that color! I have a crappy Target bike but it works for now. 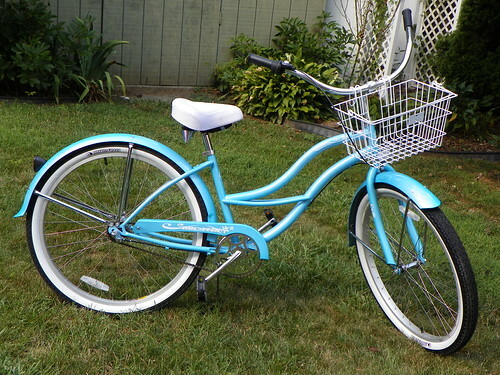 A beach cruiser is pretty awesome though. LOVE IT! 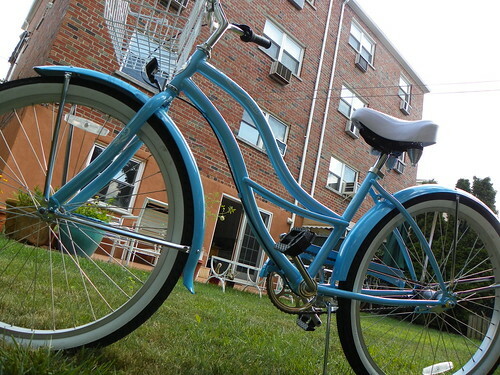 I’m super excited about getting a new (to me) bike next week, thanks to @leahchristine! It’s also a pretty blue cruiser, but, um, older than me. 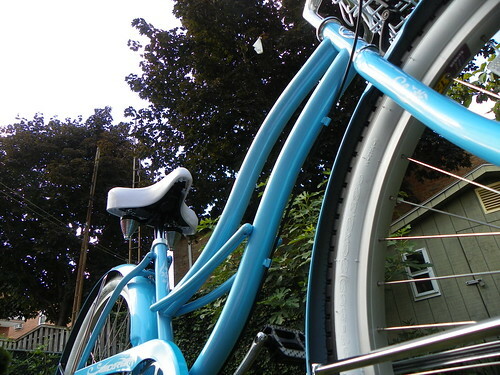 Soooo… guess who else is fervently researching adorable bikes while giving dirty looks to my old unused mountain bike? So glad you found me, btw!